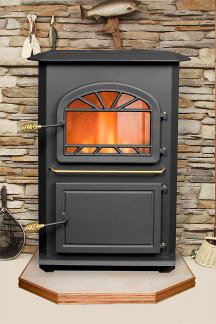 Our #1 selling coal stoker stove. The Pioneer LE Top Vent stove with its attractive styling, brass pins, brass handles and ornamental top door will make for a welcome addition in any den or family room. Using the technology that goes into all Leisure Line Stoves, the virtually indestructible feeder system has put this unit head and shoulders above all others. Built with all the latest innovations, the LE can produce up to 90,000 BTU’s input and can be vented with a chimney or by the use of the power vent system. Digital Coal-trol thermostat controlled heat always maintains the temperature you desire. Fan speeds from 35 CFM’s to 265 CFM’s are regulated by our thermostat. Set it and forget it. Without a doubt, this stoker was built with the homeowner in mind in every way.